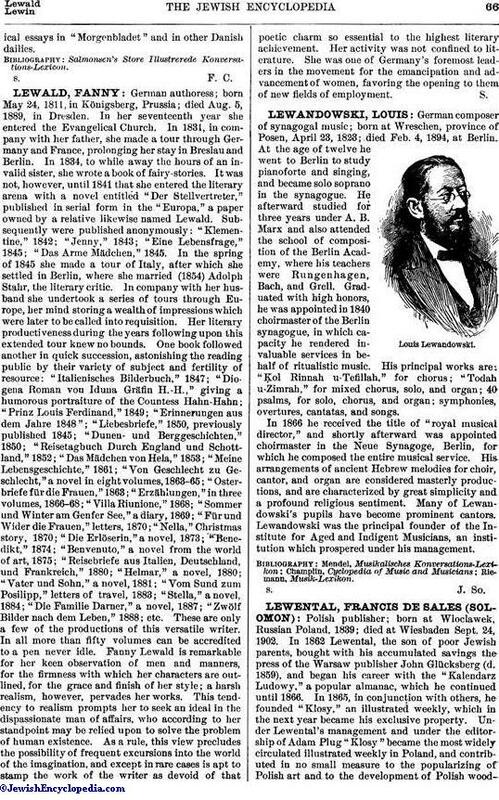 German composer of synagogal music; born at Wreschen, province of Posen, April 23, 1823; died Feb. 4, 1894, at Berlin. At the age of twelve he went to Berlin to study pianoforte and singing, and became solo soprano in the synagogue. He afterward studied for three years under A. B. Marx and also attended the school of composition of the Berlin Academy, where his teachers were Rungenhagen, Bach, and Grell. Graduated with high honors, he was appointed in 1840 choirmaster of the Berlin synagogue, in which capacity he rendered invaluable services in behalf of ritualistic music. His principal works are: "Ḳol Rinnah u-Tefillah," for chorus; "Todah u-Zimrah," for mixed chorus, solo, and organ; 40 psalms, for solo, chorus, and organ; symphonies, overtures, cantatas, and songs. In 1866 he received the title of "royal musical director," and, shortly afterward was appointed choirmaster in the Neue Synagoge, Berlin, for which he composed the entire musical service. His. arrangements of ancient Hebrew melodies for choir, cantor, and organ are considered masterly productions, and are characterized by great simplicity and a profound religious sentiment. Many of Lewandowski's pupils have become prominent cantors. Lewandowski was the principal founder of the Institute for Aged and Indigent Musicians, an institution which prospered under his management.